Pine Trees And Pearls: Bold Wedges. They are more comfy than they look! Bold Wedges. They are more comfy than they look! Bold wedges are making a a come back this spring and summer! Would you dare wear them? They really are more comfortable than they look. They may look high but if they have a 2 inch platform and the heel height is 4 inches, then it actually will feel like only a 2 inch heel! Just be careful that you don't twist your ankle (ouch!) 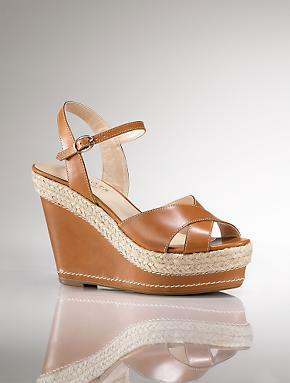 I recommend wearing them when you are sober;-) This bold wedge on the right is from Talbots. It is a little more modified for the lady who doesn't want to risk everything.